The research supports the role of exercise in the treatment of depression and anxiety. But what are the mechanisms in which exercise can assist people with mental health? 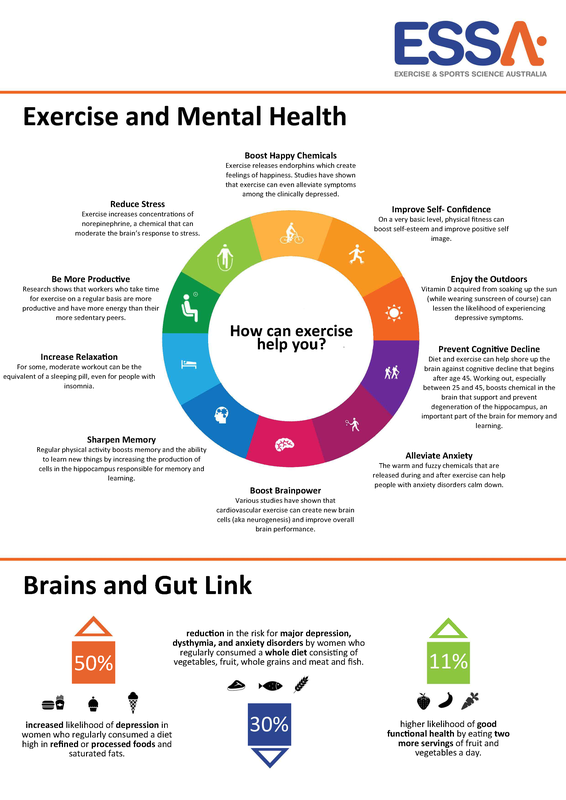 The following Exercise and Mental Health Infographic is a research summary outlining how exercise can assist in the treatment of mental health. The benefits are varied and it’s important to recognize that exercise will have a different impact for everyone. Setting up an exercise plan designed to your unique needs is essential when getting started. An Accredited Exercise Physiologist can play a vital role in designing a tailored exercise program to your unique needs; and supporting you to make positive lifestyle changes. ​As you know, exercise can have numerous benefits in preventing and treating an array of chronic diseases, one of these being Osteoporosis. Osteoporosis is characterized by low bone mass and deterioration of bone tissue leading to compromised bone strength, which predisposes an individual to an increased risk of fracture. Similarly, osteopenia is a term used to describe low bone density compared to the standard, however it is not considered a disease, or as severe as osteoporosis. 4.74 million Australians over 50 years of age (66%) have osteoporosis or osteopenia, while it is projected that by 2022, there will be 6.2 million Australians over the age of 50 with one of these conditions, a 31% increase (1). Osteoporosis is considered a ‘silent disease’ due to the fact that as many as 4 out of 5 people with osteoporosis don’t know they even have the condition even though they are at an increased risk of bone fracture. Hence, the real enemy is really the fractures that occur at a greater incidence due to Osteoporosis. While less than 5% of falls result in fracture, over 90% of fractures result from a fall. In 2013, one fracture occurred ever 3.4 minutes in Australia (394 per day), while by 2022 it is projected that a fracture will occur once every 2.9 minutes (501 per day). Globally, 1 in 3 women and 1 in 5 men aged over 50 will experience osteoporotic fractures (1). There are several reasons as to why women have a greater likelihood of fracture, which include: a lower peak bone mass, smaller bones, experiencing greater cortical thinning (loss of outside portion of bone), bone loss due to the reduction in oestrogen associated with menopause, and finally the fact that women tend to live longer and thus have more time for a fracture to occur. Of all osteoporotic fractures in Australia, 46% are vertebral (most common), 16% are hip (most devastating) and 16% are wrist. There is a cascade effect with fractures, this being that the risk of fracture rises with each new fracture. Following a fracture, there is a 2-4 fold increase in the risk of subsequent fracture, while women who suffer a spinal fracture are >4 times more likely to have another fracture within the next year. Hip fractures have a significant link to mortality and morbidity, as 24% of patients 1 year post fracture have deceased, while 80% are unable to carry out at least one independent activity of daily living (2). 3. Prevent falls - A 10% loss in bone mass in the spine can double the risk of vertebral fracture, while a 10% loss in the hip can result in a 2.5 greater risk of hip fracture. So how YOU do this? Bone is a dynamic tissue and therefore adapts to the stress placed on it. The biggest modifiable risk factor for osteoporosis is physical inactivity, and thus exercise is ‘bone building’ and leads to maximising peak bone mass, prevention of age-related bone loss and prevention of falls due to improved strength and balance (3). This phenomenon is explained by osteocytes; strain-sensitive cells that respond to the stresses placed on bone and stimulate osteoblasts (bone-building cells) to form bone. Hence, exercise can be used to maximise bone strength and prevent the onset of osteoporosis, while it can manage already diagnosed osteoporosis by improving bone mineral density and reducing falls risk. It is also associated with improved outcomes following a fracture (4). Moderate to high impact weight bearing activities which vary in direction can maintain or increase bone mineral density in older adults by 1-3%. Additionally, targeted (hip and spine muscles), high intensity (70-85% max) progressive resistance training can also have the same effect (5). Hence, a multi-modal program incorporating both weight-bearing impact activities plus PRT has been shown to be most effective for improving BMD and reducing the risk of osteoporosis or fracture. It is recommended that on 4-7 days of the week we complete 50 jumps (weight bearing exercise) to maximise bone mineral density (5). Furthermore, you must also challenge your balance which will help minimise your risk of falls. For high risk individuals (previous fracture or osteoporosis), activities to avoid include those with twisting and/or forward flexion with loading of the spine (e.g. sit-ups). Finally, complementing exercise with adequate dietary intake of vitamin D and calcium is shown to be a modifiable risk factor that can reduce risk of osteoporosis. At Inspire Fitness for Wellbeing our Exercise Physiologists work to prevent and manage an array of chronic diseases such as osteoporosis. Our design of individually targeted exercise programs will help minimise the risk of developing such conditions, while we may also help treat an already diagnosed condition. ​If this applies to you, please contact us on 9857 3007 to speak to an Exercise Physiologist about introducing beneficial physical activity into your lifestyle! 1. Watts JJ, Abimanyi-Ochom J, Sanders KM. Osteoporosis costing all Australian: a new burden of disease analysis-2012 to 2022. 2. Lu-Yao GL, Baron JA, Barrett JA, Fisher ES. Treatment and survival among elderly Americans with hip fractures: a population-based study. American Journal of Public Health. 1994 Aug;84(8):1287-91. 3. Sinaki M. Exercise and osteoporosis. Archives of physical medicine and rehabilitation. 1989 Mar;70(3):220-9. 4. Singh NA, Quine S, Clemson LM, Williams EJ, Williamson DA, Stavrinos TM, Grady JN, Perry TJ, Lloyd BD, Smith EU, Singh MA. Effects of high-intensity progressive resistance training and targeted multidisciplinary treatment of frailty on mortality and nursing home admissions after hip fracture: a randomized controlled trial. Journal of the American Medical Directors Association. 2012 Jan 1;13(1):24-30. 5. Beck BR, Daly RM, Singh MA, Taaffe DR. Exercise and Sports Science Australia (ESSA) position statement on exercise prescription for the prevention and management of osteoporosis. Journal of science and medicine in sport. 2017 May 1;20(5):438-45. Arthritis is a term coined for a range of musculoskeletal conditions where joint inflammation causes stiffness, pain and disability. Whether you’re only experiencing mild arthritis, or you’re suffering from more severe arthritis, it is likely impacting on your everyday life in some shape or form. Arthritis is more common in women than men. Rheumatoid arthritis is the second most common form of arthritis. There are more than 100 other types of arthritis, some more commonly known, such as gout and psoriatic arthritis, whilst many other types are less commonly known. It is possible to have more than one type of arthritis. Let’s take a look at the difference between osteoarthritis and rheumatoid arthritis. Osteoarthritis is an inflammatory disease that often develops with age. It progressively, but slowly worsens as articular cartilage degradation outweighs biosynthesis of new cartilage. Rheumatoid arthritis is an autoimmune disease where the body is attacked by bacteria or viruses. The speed of Rheumatoid arthritis is much more rapid than osteoarthritis, as it may travel through your circulation to other joints in the body. What Exercise is best for Arthritis? Weight training is important to strengthen the muscles around the affected joint. This will help you to maintain your ability to perform day to day tasks with less difficulty. Weight training should target the muscles surrounding the affected joint/s. For example, for an individual with hip osteoarthritis, exercises should be aimed at strengthening the hamstrings, quadriceps and gluteal muscles. This form of training is extremely important to aid in weight loss and increase blood circulation. Reducing weight helps to remove the extra stress placed on the joint, especially if the arthritis is common in the lower limbs. The best form of aerobic training for weight loss is HIIT (high-intensity interval training). Strengthening the muscles, bones and joints through weight bearing is encouraged. However, this should be kept to a suitable level as a high-level of weight bearing may cause further issues. For example, walking rather than cycling on an exercise bike may have greater benefits. However, activities such as jumping with heavy landings should be avoided. Morning stiffness may last for several hours after waking up, therefore you should aim to exercise later in the day for greater benefits. Slight pain or discomfort felt during exercise may be ok, however, if pain persists beyond 2 hours post exercise, then exercise should be modified. Fatigue may be especially present once you begin an exercise program. Extra flexibility training should be performed within a cool down. Aquatic exercise may be helpful for a short period after diagnoses of hip or knee osteoarthritis, however, there is limited evidence for any longer term benefits.